For much of human history, the moon has been a familiar, yet remote, presence in the night sky. Only recently have humans been able to explore the lunar surface to look for clues to the moon’s early history — clues that may reveal a similar history for the Earth and other terrestrial planets. Since the 1950s, more than 100 spacecraft have launched to the moon. Twelve astronauts have walked on its surface; 842 pounds of moon rocks and soil have been returned to Earth for meticulous analysis. And yet, much of the moon’s early history and origins remain shrouded in mystery. Instead, clues to the moon’s early evolution may lie deep in its interior. Zuber is uncovering such clues through data obtained through NASA’s Gravity Recovery and Interior Laboratory (GRAIL) mission — an ambitious undertaking conceived and helmed by Zuber. As part of this mission, two nearly identical probes, named Ebb and Flow, orbited the moon for several months last year, mapping its topography and gravitational field with unprecedented detail. Zuber shared results from the mission on Tuesday as she delivered the 41st annual Killian Faculty Achievement Award Lecture. The award, established in 1971 in honor of MIT’s 10th president, James R. Killian Jr., recognizes extraordinary professional accomplishments by MIT faculty. Candidates are nominated by their peers — an honor in itself, Zuber said, given the caliber of MIT’s faculty. Zuber joined the MIT faculty in 1995, and has since devoted much of her career to charting the evolution of planets in the solar system. Through her work, she and others have created detailed surface maps of Mercury, Mars and the moon. Most recently, Zuber has focused on understanding the interior structure of the moon — a body whose evolution may mirror that of Earth and the other planets. It’s widely thought that a hail of comets and asteroids bombarded the solar system early in its history, creating massive craters on the moon and surrounding planets. While such craters have largely been erased on Earth by tectonic activity, the moon has remained relatively unchanged — a preserved specimen of the early solar system. Data from GRAIL have so far revealed surprising features beneath the lunar crust. The two spacecraft measured the distance between each other as they circled the moon: Changes in the intervening distance indicated a gravitational pull from the moon, and from these measurements, Zuber and her colleagues stitched together a high-resolution map of the moon’s gravitational field. From their map, the researchers found that nearly all of the moon’s gravity is due to surface features, such as mountains and craters. Only 1 percent of the moon’s gravity, they discovered, came from inner structures — an indication that the moon’s interior may be incredibly fractured. In fact, Zuber said the extreme fracturing of the interior may have been caused by a collision with a massive body, possibly the size of Earth. 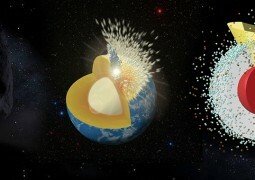 As for the very small gravitational contribution from beneath the lunar crust, Zuber said this minor signal may come from structures called buried dikes — “massive tension cracks” that could have formed as the moon’s early molten core expanded, stretching the overlying crust and creating deep fissures, or dikes, within it. The lunar map created by GRAIL is the most detailed map of the moon to date, rivaling gravitational maps of Earth. Zuber said future lunar missions may use maps created by GRAIL to determine how much energy a vehicle or an astronaut needs to scale certain elevations, such as the lunar highlands or a crater rim. She added that such high-resolution maps were possible in part because of the probes’ path: Zuber’s team programmed the probes to fly relatively close to the moon’s surface — as close as commercial airplanes fly over the Earth. At such low altitudes, the spacecraft were able to make very precise measurements, with one drawback: Every week, the team had to make adjustments to keep the probes from crashing. The probes ultimately did crash into the lunar surface on Dec. 17, nearly a year after they entered the moon’s orbit. The programmed crash was a decision Zuber made in the name of good data. While the mapping portion of the GRAIL mission has ended, researchers are still poring over the collected data. Zuber said the GRAIL team is currently the largest users of supercomputing computation time at NASA, and she hopes GRAIL’s data will continue to uncover more information about the moon’s early history.